The compactor’s 19.7- by 20.9-in (50- by 53-cm) base plate offers more than 400-sq. 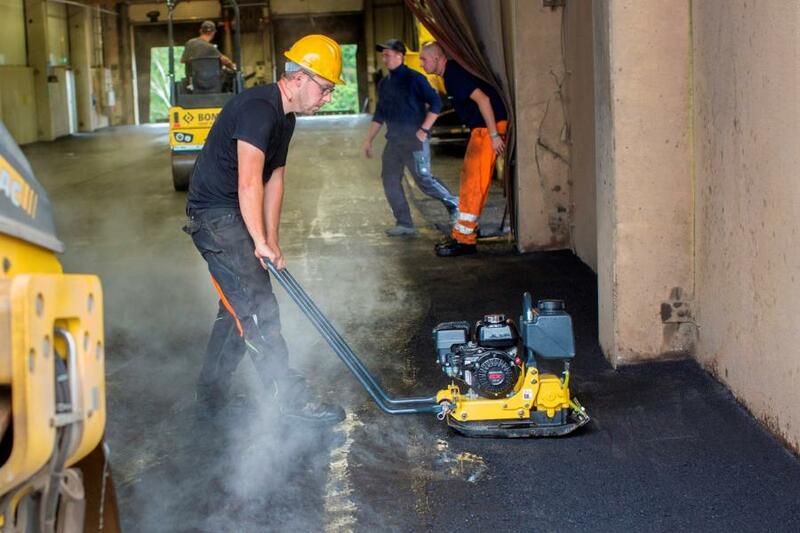 in (2,580-sq cm) coverage to make quick work of asphalt repair work or compacting around obstructions. Offering a working speed of up to 82 ft/min (25 m/min), the BVP 12/50 A features an amplitude of 0.043 in (1.1 mm) and centrifugal force of 2,698 lb. (12 kN) to deeply penetrate asphalt and granular materials and quickly meet specified densities. The Bomag BVP 12/50 A single direction vibratory plate compactor is specifically designed and equipped for asphalt compaction, expanding the machine's use beyond traditional soil compaction. This asphalt specialist features a base plate specifically designed to avoid asphalt material pushing, shoving and scuffing to deliver a superior finish. The wear resistant cast iron base plate delivers exceptional service life, according to the manufacturer. 1.8-gal. (6.8-L) water tank prevents asphalt material from sticking to the base plate, and, with the tank's lightweight design, this asphalt compactor boasts an operating weight of only 159 lb. (72.1 kg). The compactor's 19.7- by 20.9-in (50- by 53-cm) base plate offers more than 400-sq. in (2,580-sq cm) coverage to make quick work of asphalt repair work or compacting around obstructions. Offering a working speed of up to 82 ft/min (25 m/min), the BVP 12/50 A features an amplitude of 0.043 in (1.1 mm) and centrifugal force of 2,698 lb. (12 kN) to deeply penetrate asphalt and granular materials and quickly meet specified densities. (2.6 kW) Honda GX120 gas engine meeting CARB Phase III emission standards. The engine's fuel efficient design plus 0.5-gal (1.9-L) fuel tank delivers up to 2.5 hours of uninterrupted operation. Rubber buffer mounting of the gas engine minimizes damaging vibration feedback to the engine to maximize service life, while the low oil alert feature automatically turns off the engine before major component damage can occur. The Bomag BVP 12/50 A compactor features a hinged handle design that includes rubber mounts to effectively minimize vibration transmitted back to the operator's hands and arms for more comfortable operation. Its V-belt guard fully encloses the belt's movement to protect the operator from injury, while the enclosed design prevents material from entering the chamber to reduce repairs and increase service life. Compactor lifting handles help to advance safe loading and unloading from the transport vehicle. For more information, call 803/337-0700, or visit www.bomag.com/us. Doosan Adds Authorized Dealers Serving Cloverdale, Va., and Winston-Salem, N.C.